Kes Returns - In A "Fury"
She's back - and she's not the little girl we all knew. "Fury", one of the final sixth-season episodes for Star Trek: Voyager, features the return of former series regular Jennifer Lien as Kes, the young Ocampa girl whose burgeoning psychic powers were barely demonstrated with her last appearance almost three years ago. Her previous encounter with the Voyager crew pushed them years closer to their home. 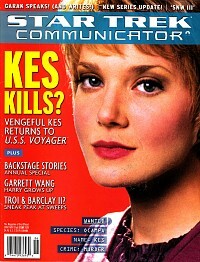 Now, in a story by the top two men in Star Trek, Rick Berman and Brannon Braga, it's hardly a kinder, gentler Kes that returns to the wayward starship. "The episodes has nothing to do with Kes' growing up," says Lien, who returned to the show for more then a week of filming earlier this year. "The character kind of comes out of nowhere. She's different than she used to be." Those differences first are realized by Voyager's crew when Kes' small vessel sets a collision course with the ship and barrels into its side. That is hardly the sole jarring impact of her arrival as she storms through the ship, kills a crewmember and then jumps backward in time in an attempt to destroy them all. "It emphasizes the existential, supernatural side of her character," Lien says, noting that she especially enjoyed her scenes with Kate Mulgrew as Captain Janeway tries to unravel the psychic girl's true motivations. As Lien says she enjoyed her return to the sets of Star Trek: Voyager, that is echoed in the thoughts of her former co-stars. Robert Picardo, whose Emergency Medical Hologram supervised Kes in sickbay for most of her run on the show, says he enjoyed his several scenes with Lien in their old stomping grounds. "Everyone was pleased to have her back," he says. "And it's pretty impressive what she has done with her character. I think this will be a big episode; a classic for Voyager. And I think fans will react to it well." And how was Lien with playing a darker and weathered side of her character? "I was fine with it," she says. "I was just acting, so it was fine for me." "If I played Kes differently because I have changed over the years, it wasn't consciously," she notes. "There were no major changes dramatically in what I had to deal with." As audiences prepare to see Kes' "Fury," Lien says she doesn't know whether she will have another adventure in the 24th Century - but she does not rule anything out. "It was good to see everybody. I had a good time," she says. "Will I be back? I don't know. I'll take things as they come."